Definition at line 48 of file serial.h. Definition at line 59 of file serial.h. Referenced by SerialDeviceControl(), SerialInterruptService(), SerialPnpStartDevice(), SerialReceiveByte(), and SerialSendByte(). Definition at line 58 of file serial.h. Referenced by SerialDeviceControl(), and SerialPnpStartDevice(). Definition at line 70 of file serial.h. Referenced by SerialClearPerfStats(), and SerialInterruptService(). Definition at line 63 of file serial.h. Referenced by SerialAddDeviceInternal(), and SerialInterruptService(). Definition at line 57 of file serial.h. Referenced by SerialAddDeviceInternal(), SerialCreate(), SerialDeviceControl(), SerialPnpStartDevice(), SerialRead(), SerialReceiveByte(), SerialSendByte(), and SerialWrite(). Definition at line 75 of file serial.h. Referenced by ReadBytes(), SerialAddDeviceInternal(), SerialDeviceControl(), SerialInterruptService(), and SerialReceiveByte(). Definition at line 76 of file serial.h. Referenced by ReadBytes(), SerialAddDeviceInternal(), SerialDeviceControl(), and SerialReceiveByte(). Definition at line 74 of file serial.h. Referenced by ReadBytes(), SerialAddDeviceInternal(), and SerialReceiveByte(). Definition at line 60 of file serial.h. Definition at line 73 of file serial.h. Referenced by SerialClose(), and SerialCreate(). Definition at line 51 of file serial.h. Referenced by SerialAddDeviceInternal(), SerialDeviceControl(), and SerialPower(). Definition at line 83 of file serial.h. Definition at line 84 of file serial.h. Definition at line 77 of file serial.h. Referenced by SerialAddDeviceInternal(), SerialDeviceControl(), SerialSendByte(), and SerialWrite(). Definition at line 78 of file serial.h. Definition at line 50 of file serial.h. Definition at line 52 of file serial.h. Referenced by SerialAddDeviceInternal(), and SerialPnpStartDevice(). Definition at line 61 of file serial.h. Definition at line 53 of file serial.h. Referenced by SerialAddDeviceInternal(), SerialDeviceControl(), SerialRead(), and SerialWrite(). Definition at line 62 of file serial.h. Definition at line 80 of file serial.h. Definition at line 65 of file serial.h. Definition at line 71 of file serial.h. Referenced by SerialClearPerfStats(), SerialGetPerfStats(), SerialInterruptService(), SerialReceiveByte(), SerialSendByte(), and SerialWrite(). Definition at line 55 of file serial.h. Definition at line 72 of file serial.h. Referenced by SerialDeviceControl(), and SerialRead(). Definition at line 66 of file serial.h. 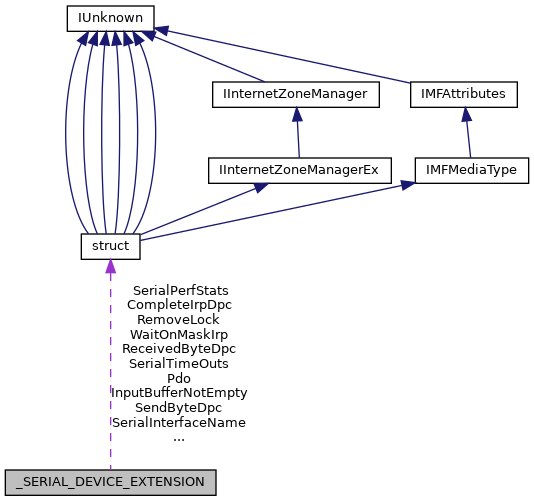 Referenced by SerialAddDeviceInternal(), SerialDeviceControl(), and SerialPnpStartDevice(). Definition at line 67 of file serial.h. Referenced by SerialDeviceControl(), SerialInterruptService(), and SerialPnpStartDevice(). Definition at line 68 of file serial.h.